Summary: The title is a good summary of the book. Blackberry Fool is the fine dessert, named from the French word for to mash or press. The story begins in Lyme, England with a mother and daughter picking blackberries, straining the seeds out, milking the cow and skimming off the cream which is then whipped with a bundle of clean, soft, twigs. When the fruit and cream are combined, the child licks the spoon. The dessert is stored in a hillside pit filled with winter ice and then served as a fine dessert to the family at supper. Finally, the little girl licks the bowl clean. Now move forward a hundred years to Charleston, SC where a slave mother and her daughter repeat the process with some changes. They, of course, do not eat with the family but they do lick the bowl in the closet after supper. A hundred years later in Boston a mother and daughter buy two wooden boxes of blackberries, and with modification, prepare Blackberry Fool for the family dinner. Then, in the present day, a father and son prepare the fine dessert with electrical tools. An intergenerational, multi-racial gathering eats outside around a table with lanterns overhead and finish with a fine dessert. Two end pages by author and illustrator explain the origin of the name, “Blackberry Fool,” and describe some of their research. A recipe is included. The end pages were stained with blackberry juice. Literary elements at work in the story: This is social history, tracing how food gathering, preparation, storing, and eating have changed. It also shows evolving patterns in domestic work. The parent-child partners who prepare the Fool help readers enter the story. The presence of slaves is a jarring but accurate presence in this history. The pattern of repetition in the words is countered by the variety in illustrations. In a book noteworthy for the accurate research underlying it, the stylized blackberry bushes seem out of place. Blackall admits that she was inspired by delicate 1800’s botanical illustrations. Theological Conversation Partners: Hebrews and Christians take history seriously; this is the arena where we see God at work. Young children have little sense of history; they do not know or care whether Washington or Lincoln came first so for young readers this is a first step into historical perspective. 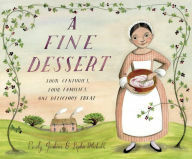 This pleasant book can be read simply as a charming introduction to social history for children. However, there are opportunities here to see the reality of change in life, things that do not change, and clues to what God is doing in the world. Eating is a central act in our faith; thanking God for food is the beginning of a meal. How food is prepared and served is an important expression of our faith. There may be opportunities to discuss some of this as you share this book with a child(ren). Psalm 46 and Hebrews 12:12, Matthew 28:20b are good adult reminders of what is unchanging. Who cooked supper at your house last night? We only see the families at the end of their meals. Do you think they began the meal by thanking God for the food. What changes do you see in who cooks. What changes in how blackberries are gathered. What changes in how the cooks get cream. What changes in how the Blackberry Fool is stored. What changes in who comes to supper? What changes in who serves supper? What are some things that don’t change in the book? A Fine Dessert by Storypath is licensed under a Creative Commons Attribution-NonCommercial 4.0 International License.